Dmitry infuses an international view of music to the instruction provided by the "Kirichenko School of Music". 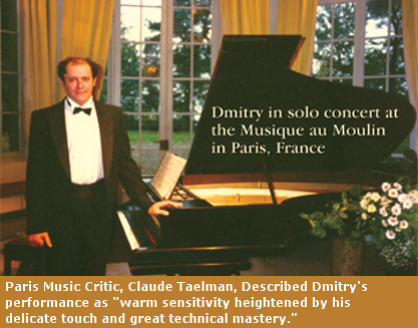 Drawing upon his unparalleled education through the Odessa and Moscow Conservatories as well as his experience performing overseas, the school is unmatched in the San Diego area. Each student experiences this world approach during instruction and applies the principles during their piano lessons, recital performances and testing. All of the materials used are specifically selected for the student and will be decided on a personal basis. Below is is an interest form for Dmitry. If you would like more information or want to book a lesson please click the "register" button to have Dmitry contact you. No obligation is made when filling out the contact form.